With its Ryzen Threadripper series, AMD wants you to “create with heavy metal”, but we all have different needs, and thus need different models to choose from. Having released both the 16- and 32-core Threadrippers last summer, the company recently followed-up with two more: 2920X, and 2970WX. Let’s put them to the test. We’re going to kick off this performance look with a handful of encoding tests. 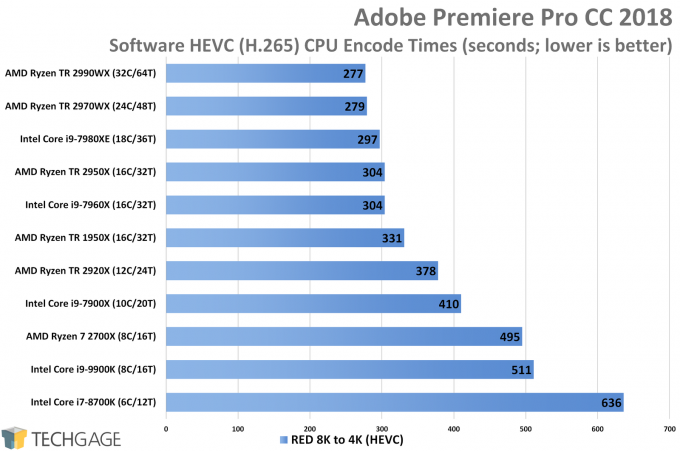 Encoding is one of those scenarios that can be extremely hit-or-miss when it comes to taking good advantage of big CPUs. Sometimes, applications will give the impression that they’re making proper use of the CPU, but we’ve found more than once that some applications actually just use the entire CPU very poorly. Fortunately, the situation is getting a lot better over time. As an example, for most of its life, Adobe’s Lightroom didn’t use more than a few cores and threads. Today, the application can use most of whatever CPU you can hand it, although we’re not sure it uses it entirely effectively. A couple of tests were scrapped for this article that were present in the 2990WX review, including DaVinci Resolve and Agisoft PhotoScan. PhotoScan didn’t give expected results, likely due to the fact that we didn’t detail the testing procedure well enough when we began running the test for that previous review. DaVinci was skipped over for the simple fact that our tests need to improve. HandBrake also got a cut because of issues with previous testing, but it’s likely to be re-added with the next suite overhaul. In time, we plan to add DaVinci back in, as well as some others. If we can ever get reliable repeated testing out of Adobe Lightroom, it will hopefully be reintroduced at some point, as well. Tests on this page include Adobe Premiere Pro and MAGIX Vegas Pro video encoding, as well as FLAC to MP3 conversions with LameXP. It’s useful that the very first benchmark in this article exhibits a performance regression we can talk about. On both the 2970WX and 2990WX, the unique memory design results in increased latency for some threads, and thus results in occasions where seemingly nonsensical performance can occur. 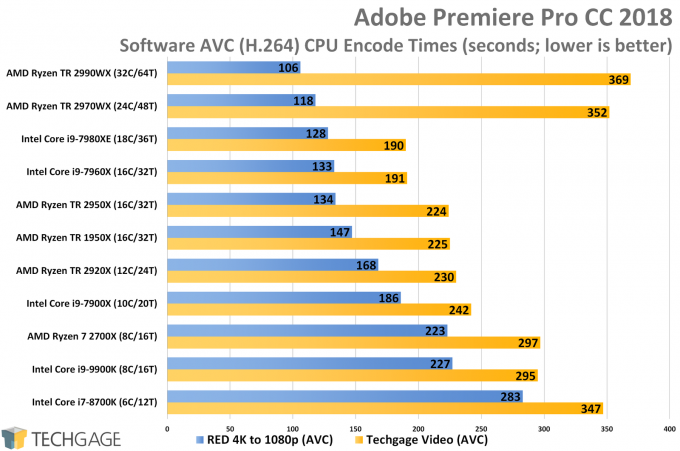 With simple encodes of one file to a different format, there’s no performance regression at all – the top two AMD chips all perform great for both AVC and HEVC. Looking beyond the 2970WX, the 2920X proves to be a strong value here. It’s a $649 chip that performs better than Intel’s $999 i9-9900X 10-core across all three tests. 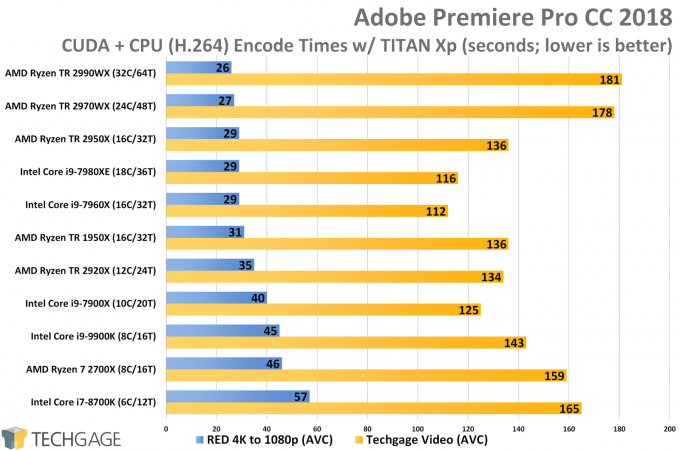 The performance regression keeps doing what it does best on the 2990WX and 2970WX, but once again, the straight-forward encodes deliver impressive performance. On the Threadrippers without the regression potential, the performance here is super-strong, and once the regressions are fixed, the top two AMD chips are going to show their strengths a lot better. In MAGIX’s popular Vegas video editing suite, scalability across the entire stack is really good. 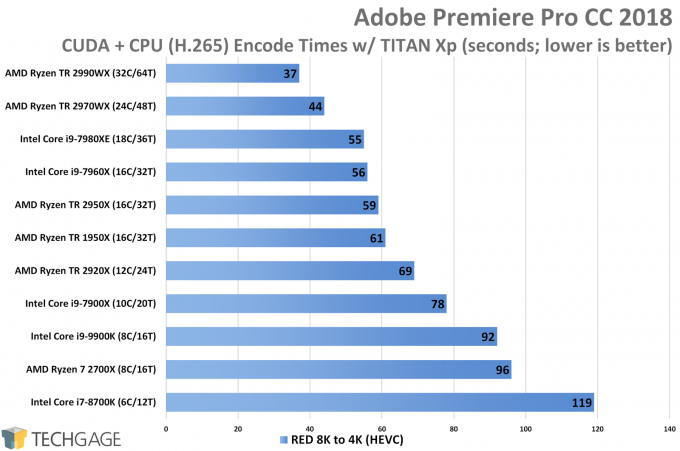 That helps the 24-core 2970WX jump ahead a wee bit of Intel’s 18-core Core i9-7980XE. The 32-core 2990WX uses its extra cores to keep separated a good distance from the others. In the i9-7900X match-up again, AMD’s 12-core 2920X performed well, again pulling ahead. While our testing could include a much greater variety of CPUs, it’s interesting that the smallest chip in this particular lineup has six cores. It’s nice to see that the many-core ecosystem has finally exploded. 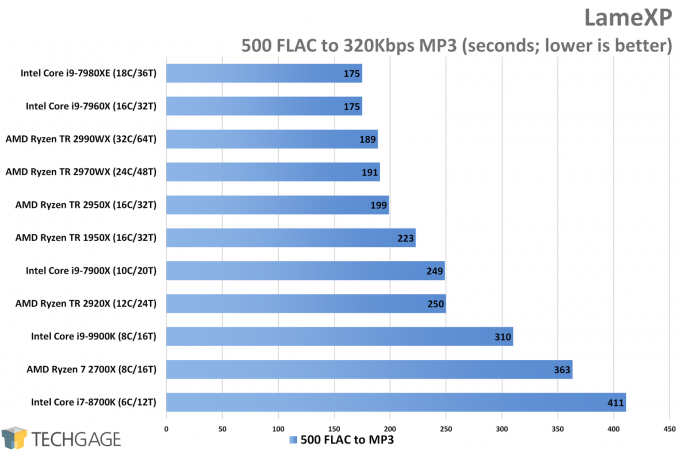 Intel’s strong IPC seemed to help its chips top the performance chart here, thanks in part to the fact that LameXP can’t use more than 32 threads. The fact it can use that many at all is impressive (and useful). After that point, the I/O might become a bit of a bottleneck, but it’s a bottleneck we’d love to have the chance to stress test!